Cosequin Double Strength is a daily glucosamine/chondroitin manganese supplement for dogs only. 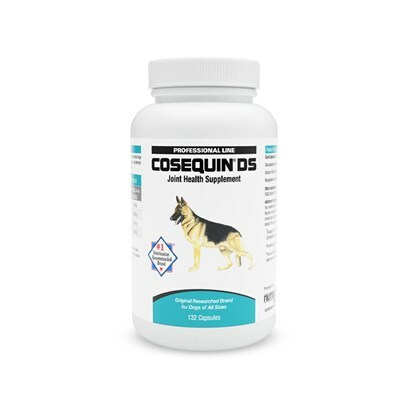 Cosequin DS is intended to treat dogs who suffer from joint problems, such as, arthritis, and osteoarthritis. It is designed to decrease inflammation, lubricate joints, and support the healthy growth of new cartilage, while protecting the existing cartilage from breaking down. Cosequin DS is a safe and effective approach to joint care, available in roast beef flavor. There are three components to healthy cartilage. They are water, proteoglycans, and collagen. Water is the lubrication and provides nourishment to the cartilage. Proteoglycans attract and hold the water, while the collagen holds the proteoglycans in place. When deterioration occurs, it is because the collagen can no longer hold onto the proteoglycans, causing inflammation, and preventing lubrication and nourishment. Since glucosamine is a crucial part of proteoglycans and the production thereof, cartilage health is improved by the supplement. Chondroitin acts with glucosamine to increase the attraction power of the proteoglycans, therefore Cosequin DS results in more fluid and nourishment, reducing inflammation and resulting in healthier cartilage and joints. Possible side effects include diarrhea. Diabetic dogs or dogs with glucose tolerance should have their blood sugars monitored while taking Cosequin Double Strength. No known drug or food interactions. Once consistent improvement has been seen, these maintenance levels may be reduced to an every other day administration. The maintenance level can also be used long term on healthy dogs to help support their joints.